How is it possible to broadcast high definition television or more standard definition services on the same physical wavelength? As mentioned in How digital television works Freeview signals can be broadcast in a number of different "modes", which are a combination of five parameters. Some of these have changed over the years because the increase in computing power has made more efficient methods of broadcasting cheap enough to fit in a set-top box - it is now possible to broadcast high definition television or more standard definition services on the same physical wavelength. As some of the ideas that are implemented would fill a text book by themselves, I have presented the concepts in a simplified way. Each Freeview multiplex is broadcast within an 8MHz channel that was originally allocated to analogue television. Rather than being a single broadcast, the channel is split into a number of different signals that sit next to each other. The original digital terrestrial broadcasts (from the launch of ONdigital) used 1,705 sub signals (referred to as 2k mode) about 4,600 Hz apart. After switchover 6,817 subcarriers (8k mode) means the signals are 1,170 Hz apart, with the high definition service using 27,841 (32ke) subcarriers just 280Hz apart. It is possible to space carriers so close together because they are carrying digital information, in the analogue domain the problem with sidebands would render a similar system useless. For reasons detailed below, the information is not transmitted in single bits on each carrier, but as groups of bits which are referred to as "symbols". Each symbol is held in the transmission system for a given duration, 1024 us. The longer this time is, the less information is carried, but too short a duration for each symbol would not allow the receiver to detect the information correctly. Each subcarrier also uses a guard interval, which turns off each carrier as part of the transmission cycle. With SD broadcasts, this is 1/32th of the symbol time (32us), on HD it is 1/128th (8us). 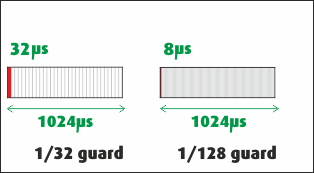 The guard intervals start each symbol and exist to deal with the problems of multipath - where the signal is being received directly and also by reflections. In non-synchronous digital transmission systems, such as those used for the internet, the presence of data corruption between the sender and receiver can be signalled back to the source and the data resent. However, a digital broadcast is a one-to-many unidirectional system, with no ability to ask for data to be resent. For this reason, the transmissions use "forward error correction", which is a system that allows a certain level of errors to be detected. The most basic form of a forward error correction (FEC) would be to transmit each bit twice - as long as each bit was sent along a separate subcarrier, then a single bit loss on one carrier could corrected by using the one sent on the other carrier. However, this is very inefficient, as it reduces the useful capacity of the system by half. So, instead the DVB-T system uses a Punctured Convolution coding system. Instead of sending each bit twice, bits are grouped and then a code that describes the bits in a way that a single bit error can be detected and corrected most of the time. In the above descriptions, the word "symbol" was used to describe what is transmitted. You may have thought that a digital system would transmit information on the subcarriers as bits. However, doing this in a broadcast system is actually unproductive. For this reason, quadrature amplitude modulation is used. This takes the incoming bits and encodes them in groups. The most basic form encodes bits two at a time, using sine (Q) and cosine (I) functions that are then added to the main carrier. In effect "00" is encoded as -Q-I, "11" as +Q+I, with "01" and "10" being +Q-I and -Q+I. At the next level, as used for DVB-T, the bits are encoded in groups of four bits (16QAM) or eight bits (64QAM), with DVB-T2 being groups of 16 bits (256QAM). "high capacity commercial multiplex mode". I can't get any signal (Strength 0 quality 100) from C32 from Blackhill transmitter. All other channels have 70+ strength. Any suggestions? Please give a full post code so we can check whether you location is served by those channels. Do you think that anyone is still using DTG-2, or any of the other 2K FFT modes? The Winter Hill ( Which Freeview channels does the Winter Hill transmitter broadcast? ) was the only one I could find on the site. But Digital UK | Multiplexes lists the G-Man Mux as using 8K FFT now. Malcolm Thwaite: If yo were before and now your not, check your system. Hi, are you interested in updates to transmitter frequencies? I have had to painstakingly work out the channels for the Tunbridge Wells transmitter for my raspberry pi/DVB-T2 hat/tvheadend set up and I'm happy to share these to update your website if it is useful? You could have saved yourself a lot of work by using the Digital UK Coverage Checker, see Digital UK - Coverage checker and putting in your post code and house number. That would have shown you all the transmitters available at your location, given the channels used now and in the future, given the direction to aim your aerial and even what type is needed for each transmitter. It also gives the distance away and the expected reception conditions now and in the future. This website channel usage information is known to be out-of-date as the owner, who is the only person allowed to update it, is not available and has not been for a few months. The advice given above has been given on many occasions via these pages. Thanks Mike. The info was on a section you had to expand to read and I didn't spot it - still, it was a good education on the way these things work. Shame you cannot update the details on these webpages.